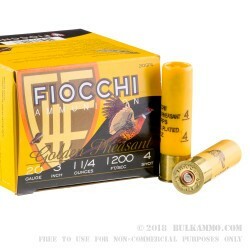 This 20 Gauge shell by Fiocchi Munizioni is loaded with 1 ¼ ounces of #4 shot. 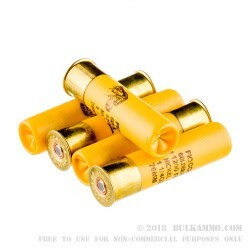 The shot sports a nickel plating in order to combat pellet deformation in the barrel, which coupled with this shell’s 1,200 fps muzzle velocity gives it a nice even spread that packs a serious punch downrange. 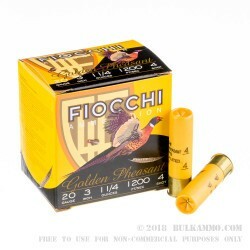 This shell is offered under Fiocchi’s Golden Pheasant line of ammunition, and quite aptly -- its shot size excels at bringing down pheasant, especially when fired from a shotgun fitted with an improved cylinder, modified, or improved modified choke. 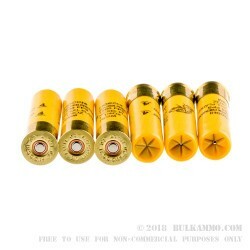 Don’t let its name limit your imagination, however, as with its tight pattern and long range this shot will also take down stately toms and even geese under the right circumstances. It’s also suitable for home defense, as it will seriously deter a human-sized target but lacks the punch to reliably break through walls.